Meghan is really into raising awareness of Cowden’s Syndrome and other Rare and Genetic Diseases. She is extremely excited about “World Rare Disease Day” on February 28th. 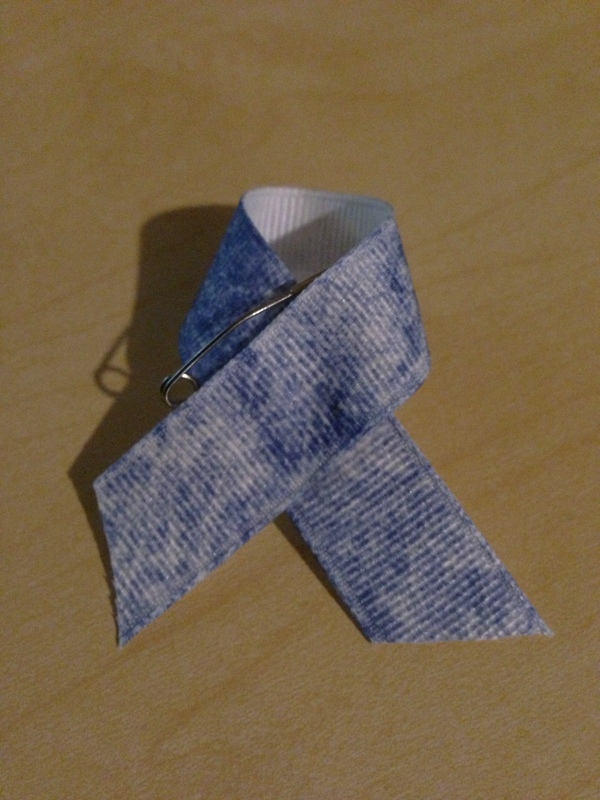 We are in the process of making MANY denim ribbons that look like this. 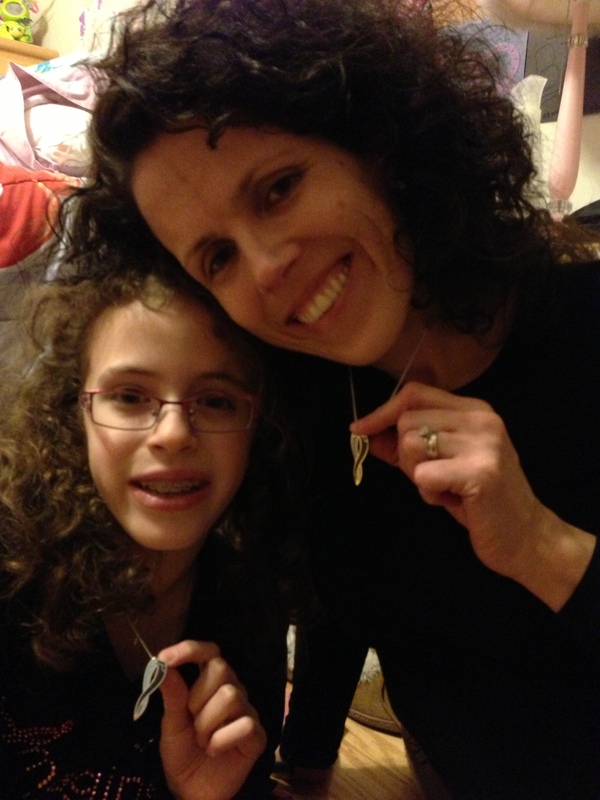 She plans to ask her principal tomorrow if she can give one to every staff member and student in the school. She wants to do this purely to raise awareness. Her ideas for fundraisers are developing separately. 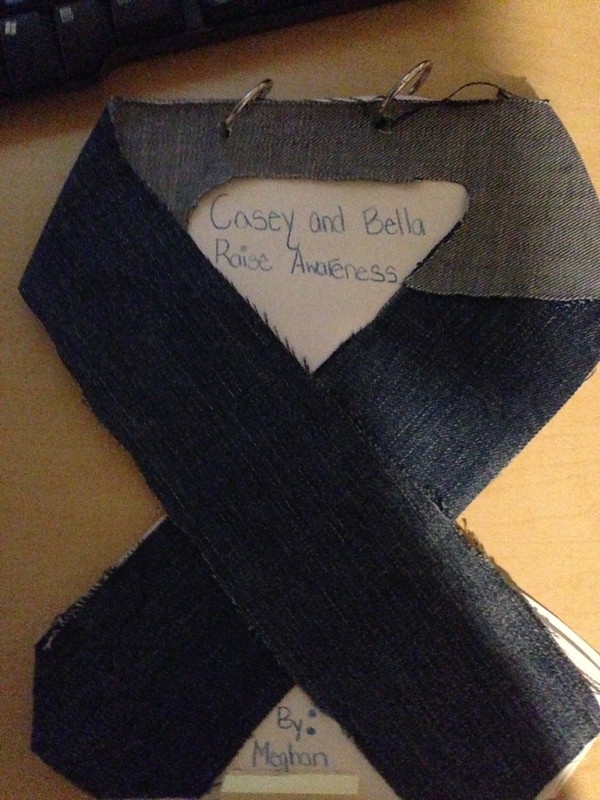 She has also researched statistics on Rare Diseases, and came up with this sheet to attach to the ribbons. My name is Meghan… and I have a Rare Disease called Cowden’s Syndrome. It is a genetic disease that affects only about 1 in 200,000 people. (That is only about 1,500 in the whole USA!) One of my genes called PTEN is broken. It causes tumors and vascular growths in my body. I have lots of surgeries. My Mom has Cowden’s too. We are luckier than a lot of other people with rare diseases. 1. There are about 7,000 types of rare diseases. 2. Some of the rare diseases affect less than 100 people. 3. 50% of all rare diseases affect children, and are responsible for 35% of the deaths in the first year of life. 4. 1 in 10 Americans are living with a rare disease. 5 About 350 million people in the world are affected by rare diseases. 6. If all the people with rare diseases lived in one country, it would have the 3rd biggest population in the world. 7. 80% of rare diseases are genetic. They can present at any time in a person’s life. My mom was much older than me when she was diagnosed. I was diagnosed first! 8. There are no cures for any rare disease, and only 5% of them have any treatment. 9. Over 50% of all rare diseases have no foundations, support groups, or anyone looking for a cure. 10. Cowden’s Syndrome isn’t fun, but when it comes to rare diseases, we are some of the lucky ones. That “play on words” is why we wear denim, and denim ribbons today. In addition, because maybe there was a chance I couldn’t get any more proud, she received a book assignment from school. She had to write a story where the main characters were two dogs named “Casey and Bella.” She decided to write about what meant something to her. I have no idea who will win, but you know who gets my vote. 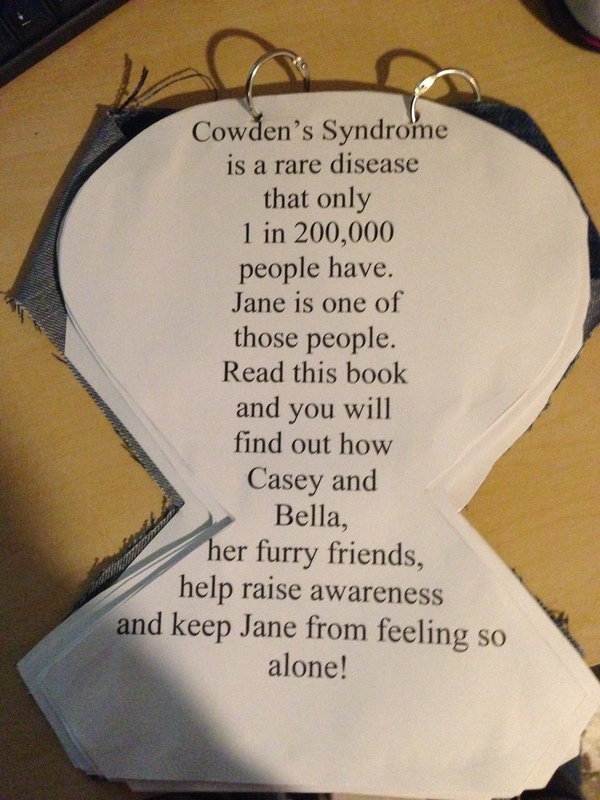 Everywhere she goes, she seems to take an opportunity to tell someone about Cowden’s Syndrome. She says people need to know. She uses our necklaces to start all sorts of conversations. I think she is just the girl to make it happen. Someone in one of my online groups asked if we knew anyone famous with Cowden’s Syndrome. Does… I know someone trying to make Cowden’s Syndrome famous count? Reblogged. Because it’s just *that* important. Way to go, Meghan! Keep up the GREAT work!!! Thanks for this. I learned lots of things. Till I found you all I had no idea about rare Rare Disease Day. Great post. I have a question. Where can I get a necklace? hi im a mother of 3 beautiful children they all have cowden syndrome, i am doing a fundraiser and have made it my mission to raise awareness, i have a fb page called raising hope – cowden syndrome awareness im from austraia Id love to work with u in our cause?